New large-format PageWide technology announced. The HP Designjet T3500 Production eMFP features an ultra-fast processor and a high-productivity scanner HP has announced the scaling of its inkjet-based PageWide Technology for large-format printing, delivering high-quality prints at faster speeds and lower costs. This innovative technology, which consists of more than 200,000 nozzles on a stationary print bar and spans the width of the page, enables users to produce a variety of black-and-white and colour applications, such as drawings, maps and posters. HP PageWide Technology will disrupt the $1.3 billion production printing market currently dominated by monochrome light-emitting diode (LED) printers. The HP Designjet T3500 Production eMultifunction Printer (eMFP), the most productive large-format colour multifunction printer in its category, ideal for use by enterprises. The HP Designjet T7200 Production Printer, a full-colour large-format printer built for central reprographic departments (CRDs) and reprographic houses with high-volume print demands. HP Designjet SmartStream, a software programme that streamlines the complete printing workflow. These solutions can handle the volume and diverse print needs of enterprise organisations; CRDs; architectural, engineering, construction (AEC) and design firms; public sector agencies; quick printers and small- to medium-sized reprographic houses. With inkjet technologies, the ink vehicle, which carries the colorant to the surface of the printer, is crucial to the stability of the ink, the drop ejection process and the overall print result. The HP PageWide printhead is built with thousands of identical drop generators that offer uniform volume, speed and trajectory for precise printing. The technology also regulates the speed and penetration of Original HP pigment ink to accelerate drying and to control dot size, feathering and colour-to-colour bleed for high-quality prints. The compact 36-inch HP Designjet T3500 Production eMFP requires no warm-up time and features an ultra-fast processor and a high-productivity scanner with batch-scanning, multipage PDF creation and scan-to-email capabilities. The device also allows for unattended and low-cost operation, producing monochrome prints at the same cost per page as LED MFPs. For printing jobs requiring high security, it is built with a self-encrypting hard drive, secure disk erase and controlled access printing. The HP Designjet T7200 Production Printer can produce both colour and black-and-white prints on a wide range of media The 42-inch HP Designjet T7200 Production Printer is capable of handling three heavy media rolls. It can produce both colour and black-and-white prints on a wide range of media, from bond to glossy photo paper, with a low cost of operation comparable to monochrome LED printers. The HP Designjet SmartStream software makes print management more efficient by streamlining workflow for highly demanding print environments. It offers true PDF management, along with accurate and error-free prints with the HP Crystal Preview technology. It also can reduce job preparation time by up to 50 per cent on multipage print jobs. For IT managers, HP also introduced a new HP Designjet Universal Print Driver, which allows users to manage their entire HP Designjet fleet with a standardised single driver. This reduces the amount of time and cost in testing and deployment—and in keeping the software across all HP Designjet printers up to date. The HP Designjet T3500 Production eMFP is now available worldwide with an estimated starting list price of £9,995. 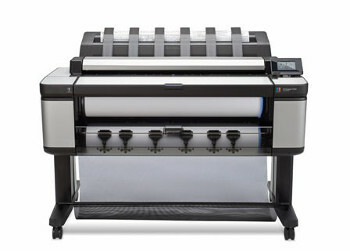 The HP Designjet T7200 Production Printer is currently available in the USA only. 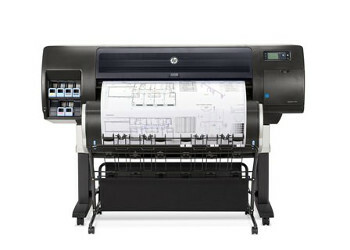 The HP Designjet SmartStream Pre-Flight Manager and Controllers are expected to be available worldwide on 30th June for an estimated starting list price of £840 and £420, respectively. More information about the latest additions to the HP Designjet production printing portfolio is available in an online press kit at www.hp.com/go/DesignjetProduction2014 and at www.hp.com/go/designjet. Videos and updates on the new products are available on the HP for Designers Facebook page, the HP Graphic Arts YouTube channel and the @HPGraphicArts Twitter handle.